Brain Injury: When I was 18 months old, I was jumping in my crib and hit underneath my left eye on the pipe of the crib. Days later I had a seizure. Explanation of Mask: The “z’s” on my mask represent all of the trouble I have sleeping. The blue glitter represents the side that received the most damage while the pink glitter on my forehead represents the migraine headaches and seizures. The pink ribbon on my chin reminds me to have a positive outlook on life despite what I am going through. The tissue paper shows all of the sinus infections that I have had. “LOVE” represents how I had trouble loving myself, so I wrote it on my mask as a reminder. The brick paper symbolizes the fact that I have had a lot of heartbreak in my life, but I am okay. And lastly, the lipstick reminds me to stay pretty! Brain Injury: Motor vehicle accident, received a traumatic head injury, as the result of my car going off the road hitting four trees. 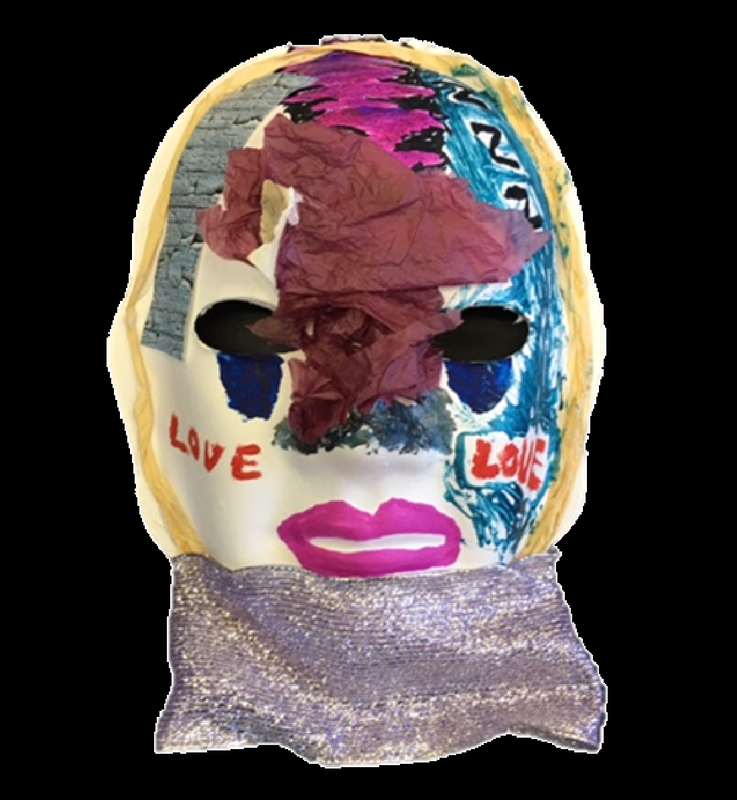 Explanation of Mask: I had a lot of love in my heart. I went off the road and hit four trees, and was rushed to the hospital. After telling me there was nothing they could do, I was sent to Maine Medical Center. There I was told I suffered a traumatic brain injury. They would have to work on me, and do many extensive operations. I was in a coma for 6 weeks, and the doctors did not see any hope for me. But, my parents were dedicated and trusting and staying by my side. After 6 weeks, I came out of the coma and my mom was in the room and I said, “hello” to her. They got my doctors, and they took care of me. After a little while, the doctors did all they could, and decided that if I wanted, I could go home and receive help at Portsmouth hospital, which I did. I still had a lot of love in my heart, but was still confused about a lot that was occurring around me. I went back to school in September, which was very hard. I had many positive influences in my life, which make me who I am today. I now have a lot of love in my heart, which helps me with my daily struggles. 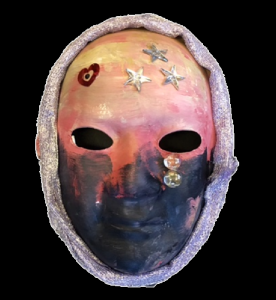 Explanation of Mask: The sparkly ribbon represents the happy life I had before everything changed. The gradations of paint color I choose are like how things changed through my life. It started out good and happy. And “it” [my accident] happened and the gray and black mean the sad I felt. The tears from the eye are for sadness. The stars mean joy that makes me dance, like I’m a star! The heart is the love I feel and used to feel for a woman. I had 20 years, and then I got attacked. I was happy, danced, and had love. Then I couldn’t speak for three months. I worked hard. After the accident, I started to get back to things. I could speak and dance, and I still want more. I feel hopeful. Brain Injury: Motorcycle accident due to drinking and driving. Among many other injuries to my body, portions of my parietal and frontal lobes were removed, which control the left side of my body. Explanation of Mask: The grey side represents the dark gloomy life due to depression I Lived before my injury for 14 years. The right side represents the bright, happy life I live now. The broken chains the represents the depression being erased from my life. 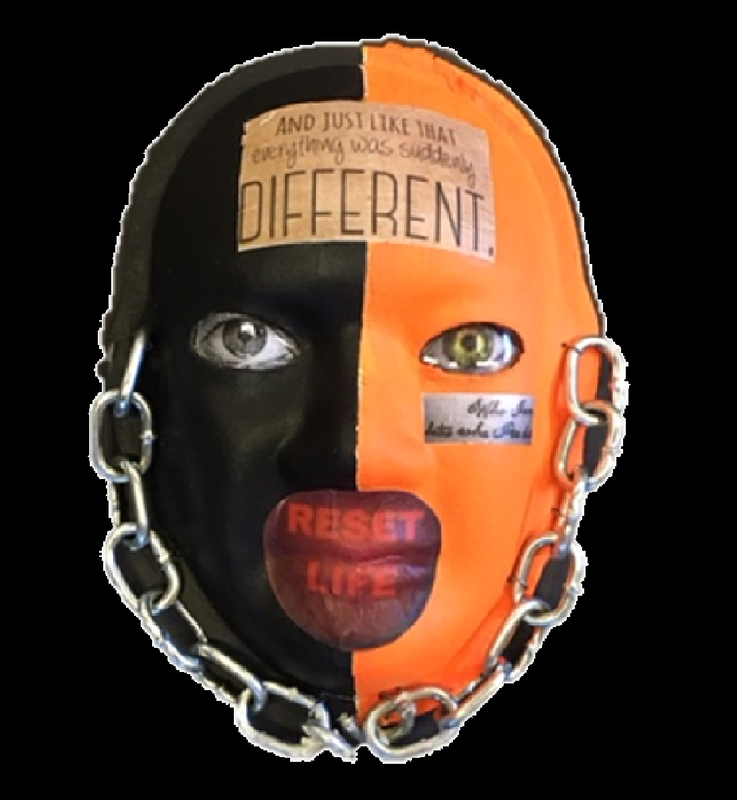 The “reset life” on the mouth represents how my life was changed forever, for the better, that night. The quote under the left eye represents what it says. “Who I am hates who I’ve been.” And the quote on my forehead further explains how life as I knew it changed in the blink of an eye. 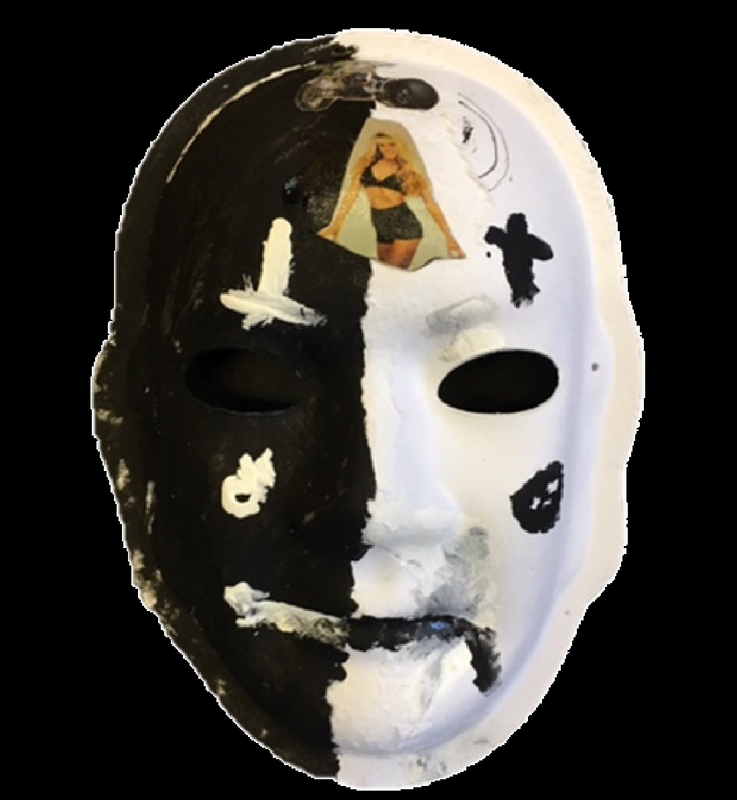 Overall, the mask shows that I am now happier that I’ve ever been, and I’m in a better place than before my injury. 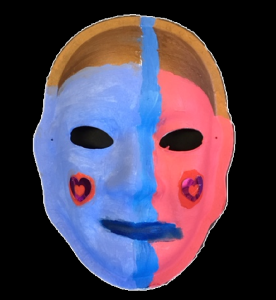 Explanation of Mask: My mask is like a mirror. The black represents having no knowledge of where life will take me next, while the white symbolizes purity and my sense of a new beginning. 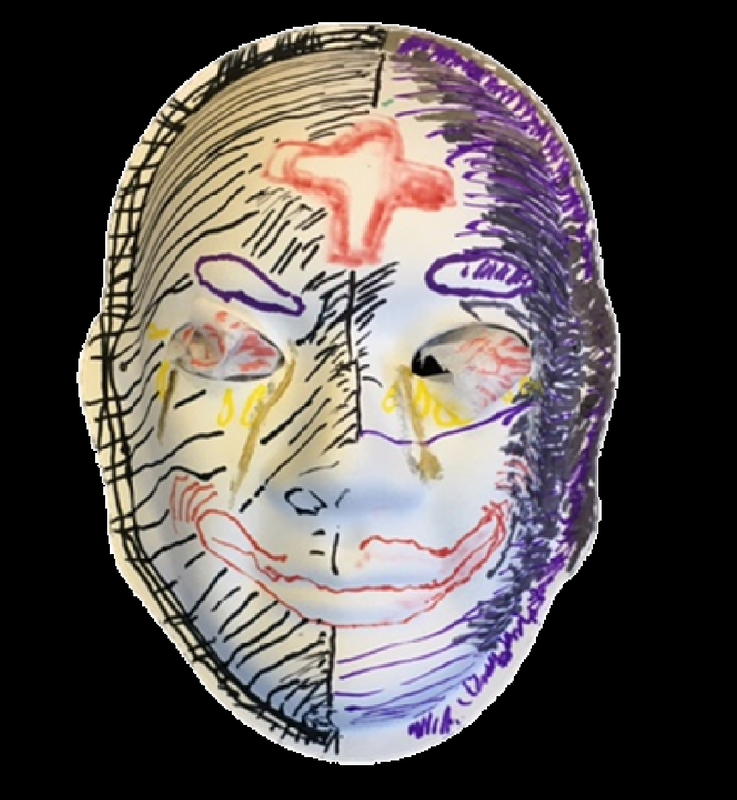 The peace signs on both sides of the mask show my feeling of serenity after the illness and therapy. The question mark was used to show how confused I was about life and questioning why the accident happened. The crosses show two different aspects- I believe God was with me through this all, but I also believed he deserted me. I used to smile when everything was normal, but after my accident all I could do was frown because I was confused. As bad as my situation was, it kept me from a lifestyle that was not healthy-I was a crack addict for 4-5 years and it took being in a coma for me to realize that I needed to change my view. I felt lonely before my accident and continue to feel lonely to this day; I lost the two things I loved most, my girlfriend and my motorcycle. Explanation of Mask: If you see my face, I look fine but underneath I have a war going on within my body. My white blood cells constantly attack my myelin, which is what you see in my hair. One side is normal like before, then the other is damaged; the coating of the wire is cut away to expose the bare wires. That is how the signals are disrupted from my brain to my body. My brain is like a computer. In an MRI image you could see a large mass of scar tissue. 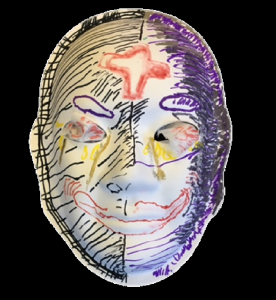 The scars make it feel like it’s broken and damaged; and that is why I cut my mask open so you could see the damage that you may not see outside. 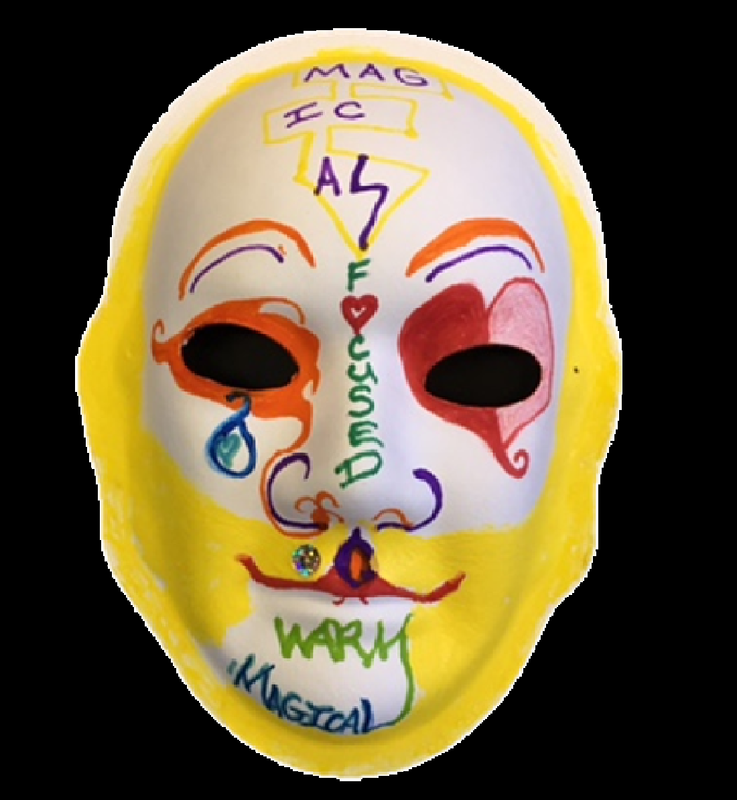 Explanation of Mask: The gold and silver tears represent loss of income following instant unemployment. The blue represents the depression and suicidal thoughts that came to my mind after my injury, which are hard to avoid, and the glacial pace of progress towards my recovery. I chose the color purple because “I am a king” and the color purple is considered royal. The red and white cross represent the myriad medical specialists during my recovery road to healing. I also used the olor white to show the “snowed in by an avalanche of losses,” ways which will lead to the quickest recovery. Black is for left side loss of feeling and smell and taste with a lopsided smile. And lastly, the red blood shot eyes on my mask show all the worrying I have been doing. I have a hint of a smile; a sense of humor is vital to a healthier recovery. 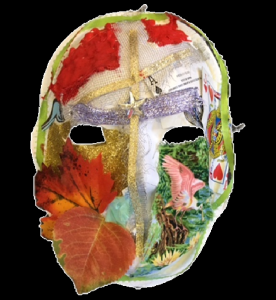 Explanation of Mask: The mask represents the journey from my injury to present. It represents the beginnings of life- a rebirth from Christ when he gave me a kiss on the forehead. Then I woke up from that coma, and I woke up hungry. The mesh represents Jesus Christ. I was very lucky to survive my injury and when I awoke from my coma, I could enjoy playing cards again. That’s why I put cards on my mask. I lost my best friend and the leaves, like fall, are that part of my life. 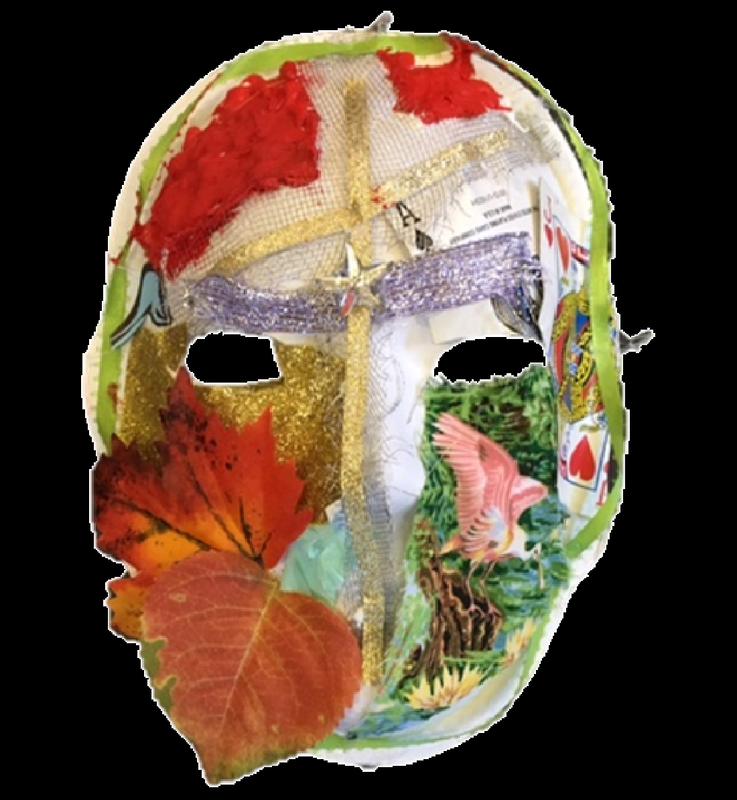 The star on the mask is my rebirth- I am thankful. The blue bird represents the good part of my life. 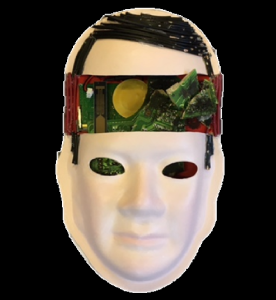 The red paint shows where I was injured, while the green ribbon around my mask represents my favorite color. I added the gold to bring me happiness and I think it looks good! 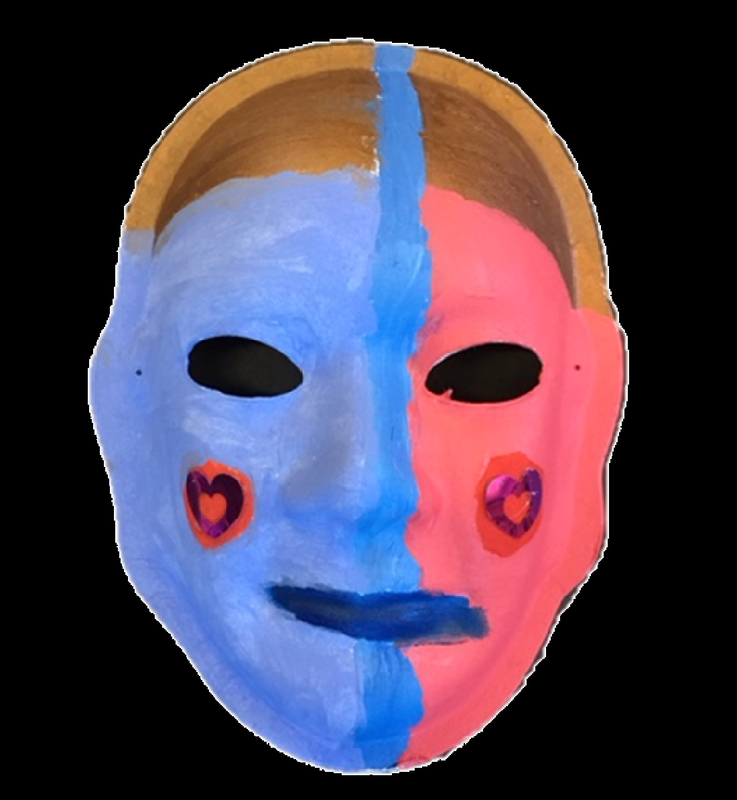 Explanation of Mask: The copper color at the top of the mask is like hair, and I used blue paint because it is my favorite color. The red on the cheeks and the mouth means happiness, which is what I feel. I am thankful to be alive, so I am joyful and in a good mood all of the time. The line down the center of the mask means you have a choice to be grouchy or happy. I choose happy! Brain Injury: I had 2 brain injuries and a few concussions. The first one was almost 20 years ago, in 1997, and I was hit by a drunk driver in January, and I was in a coma for almost 3 months. The second one was 8 years later when I was walking up the stairs of my place on December 1st and my sweet, adorable, little crap of a kitty, MooMoo, tripped me and I fell downstairs, breaking both of my arms and getting another brain injury. 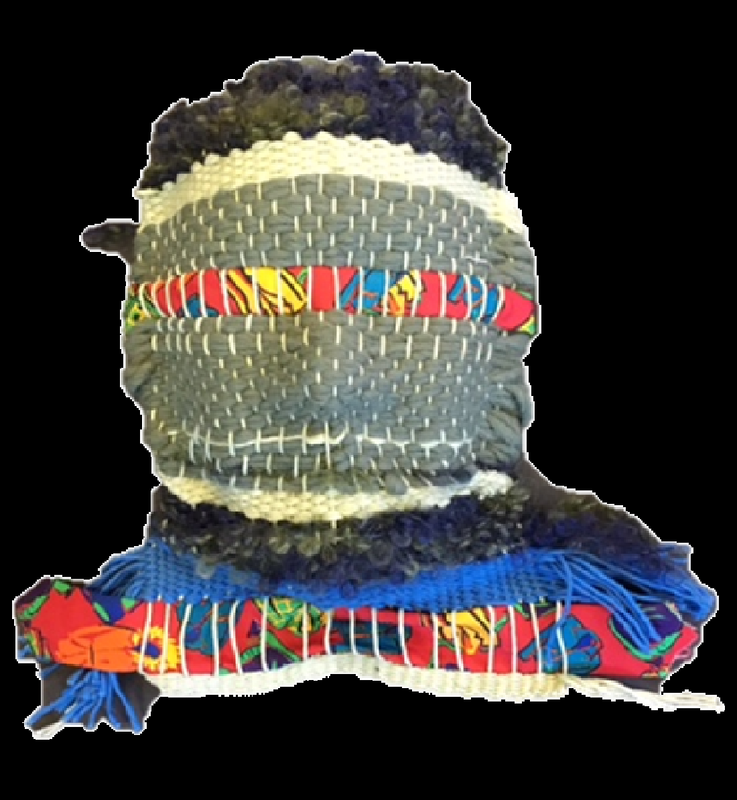 Explanation of Mask: I made this out of one of my weavings. I had a dream about doing a mask out of one of my weavings. Although the tie going over my eyes may make the public think I am blind, the greater symbol is over my mouth because I don’t/can’t really talk. What I Gained: I have a groovy idea about everyone and everything. What I want the community to know: We’re not stupid.